I joined the George H.W. Bush White House as a twenty-something presidential management intern after completing my Ivy League master’s degree in public policy. Becoming deputy associate director of education policy for the Office of Economic and Domestic Policy was a dream job. I could never have imagined stepping into an office in the Old Executive Office Building and calling it my own when starting graduate school. Having been invited to serve the man who occupied the Oval Office and declared his intention to be the Education President made it all the more meaningful. As all can attest who accept such a role, the hours are long and the benefits are priceless. Being in the center of the national conversation and influencing the direction of national policy is a heady experience. But that is where the character of the president we honor this week offered lasting life lessons for me. First, prudence is a virtue. My generation will recall the Saturday Night Live comedy skits Dana Carvey mastered of our 41st president – the hand gestures and phrases that Carvey may have repeated more than the actual president became part of President Bush’s lasting persona. Especially the phrase “wouldn’t be prudent.” I heard this line enough out of George H.W. Bush’s mouth that it would have stuck either way. And I couldn’t help but reflect on what he was conveying. For a young woman new to politics, it spoke volumes. There are situations which tempt an expedited response, but a pause to reflect and a measured approach might result in a better solution or outcome in the long run. Prudence was a guideline to govern the decision-making process. Prudence might lead to results that aren’t always optimal or politically expedient, but generally never regretful. Second, kindness counts. President Bush admits he was never good at the “vision thing.” But from the moment he took the oath of office, he cast a vision of a “kinder, gentler nation” that guided his presidency. It was this principle that inspired his“Thousand Points of Light” to recognize the organizations in our communities who reach others with kindness and compassion. Literally, one such organization a day was highlighted throughout his presidency from the moment of inception! We staffers would get the press releases and be reminded every day of the virtue of serving others. President Bush’s personal letters were another way he showed kindness. He was a man of the written word, whose heart was not easily expressed vocally, but bled all over the page in ink. Troves of these letters are treasures for so many people and have become the basis of the only autobiography ever written. Third, faith matters. 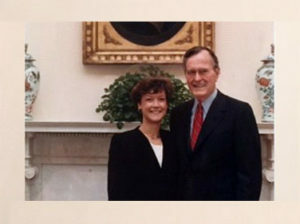 While private in his demonstrations of religious or spiritual expression, President Bush exemplified the foundation of faith that upheld his life. He stood on solid ground and an abiding belief in God, in humanity, and in the founding principles that birthed and upheld our nation. He conveyed calm in the midst of the storm through major events of his presidency, like the Gulf War. He invited people to the table to negotiate tough issues, like the nation’s governors on education or congressional leaders over major policy pursuits like the Americans with Disabilities Act. He believed that good-faith efforts to find common ground while keeping your word can lead to breakthroughs. His integrity was not always matched by the other side, yet he never lost faith in the potential of people to do the right thing. In Washington, some may call that naïve. I call it noble. George H.W. Bush, our 41st president, was indeed a man of honor, worthy of our every remembrance for a lifetime of service to our country. Thank you for being my first and lasting example of prudence, kindness, and faith in the midst of Washington politics.